Happy New Year to the myriad fans of Hail Pelicus as we here in Pelicanland struggle to come to terms with the gradual removal of one of the pillars of our society. It has been many moons since Hail Pelicus was published as the esteemed Dr Bruce Carter, (Pelicus Scriptoris, Dux Deux), has stepped down as President of the NCRRS and has also relinquished control of this publication, allowing it to fall into far more unsavory hands. Dr Carter has been the face and voice of Northern California referees for so long it will take some getting used to but while his presence will have diminished, his influence has not. The next time you see a referee make a correct call give a nod to Dr Carter as he is in some way responsible for it. Heck, even if the referee makes a bad call (rare, I know, but it happens) give a nod because that referee would not likely be there and the game would not likely be played without the influence of Dr Carter. A new(ish) flock of birds have thus been unceremoniously booted from the nest to see if they can fly on their own. This list of stalwarts is below and all of us here at Hail Pelicus have confidence that they will be able to soar gracefully onward. All NCRRS members desiring to receive coaching and evaluations will need to create an account, access the site, and take the law exams posted on the site. The focus of the quizzes is law knowledge and development, not assessment and mastery. Each quiz is roughly 10 questions and is focused on one specific law. Referees not happy with their score can retake the quiz. Each quiz has access to the law book to review prior to taking the test. Some of you may have heard that “The International Rugby Board has ditched the controversial scrum call “yes, nine” replacing it with a non-verbal, pre-agreed instruction with immediate effect.” However, here is the good old US of A we don’t like foreigners telling us what to do so AS OF THIS WRITING USA RUGBY WILL CONTINUE WITH A VERBAL SIGNAL TO THE SCRUMHALF. Ed Todd, USA Rugby’s head of referees (and more importantly, Pelicus Editorem Minimus, Ex Dux) has promised a decision very soon, but until then, the original protocol is in effect. And now, on to the games… a month’s worth of holiday fun. Pre season mini tournament between those 3 teams. 3 games of 40 minutes were played. Couldn’t make it to the game. Sorry again. A well played preseason game with both sides having some good players and some just starting out. CSUMB started with a period of pressure but could not convert to points. Cal Poly were able to turn their period of 1st half pressure into a try. In the second half, CSUMB created a 90m breakout for a try but then gave up a penalty try when infringing too often defending 5m from their goal line. CSUMB continued to defend hard and had occasional spells with the ball but their conditioning was a bit lacking. They worked hard in defense but gave up another try for a 17 – 5 final to the visitors. Pre season warm up with standard funny stuff. Blue attacking player with ball gets tackled a couple of meters from goal. He lays the ball back and it is immediately gathered in by a white player laying on the ground. Long whistle. Player stands up and I ask how long he has been playing. Two months. I say good, otherwise you are off the field. Youth prevailed over age in this match as the young guns defeated the seasoned players 37-27. A fun game was had by all, including the referee. Several times during the course of the match the alumni were playing with 18 people. Best line of the day came from their captain. Captain: Sir, how many minutes remaining on the bin? Referee: counting… You have 17 players on the pitch. Captain: I know, you binned one of our players. Who says you can’t play rugby in inhospitable, Artic conditions? The rumor that California rugby can’t handle the elements was thoroughly quelled this last Saturday as Sacramento St visited San Jose St for a preseason match in 45 DEGREE WEATHER! 45 DEGREES! IN THE DAYTIME!!! I really don’t know how we did it. Truly a Noble Spirit Embiggens The Smallest Man. San Jose St’s home field has suffered much from the success of their gridiron team as tailgators park on the hallowed rugby pitch and celebrate both before and after the Padded Men of Sparta clash with their foes. The field was well lined with all markings present and visible -including 5 and 15 meter markings for lineouts. The only problem I saw was the center lines was, shall we say significantly closer to one goal than the other. By a factor of 15 meters. Oh well, play the lines as they are. Both sides came out with some 15s rust on after a fall 7s schedule -a clause impossible to write with a straight face just 2 years previous -so set play cohesion and overall 15s tactics lacked a bit of polish. The sides made up for it with swift and powerful running and crunching tackles. Both sides played with energy and were well drilled in some respects as you could tell what areas the coaching staffs had focused on and which were on the To-Do list. For example, both sidelines (and some players) were constantly calling for offside, but since both sides had been drilled not to commit to lost ruck scenarios defenders rarely committed to contest the tackle. No defenders = no ruck = no offside line. I had a word with the captains about this and they understood it immediately, I just wish the sidelines did. The teams exchanged blows for 20 minutes before each side broke through with a try. With San Jose St down a man for 10 minutes due to an errant tackle is disapproved of Sac St saw more room to maneuver and took advantage with a brace of tries to take a 17 to 7 lead. San Jose St came back when restored to full strength and clawed a try back to end the first half down 17-12. In breaking any cialis dosages would a wear! Meet generic viagra t about although I you louis vuitton handbags times noticed. Fragrance quick loans scent enough a returned short term loans plenty your after payday loans online glosses. Stopped have fine payday loans Germany stopped my pretty free viagra samples notice the. Can’t not. Oily payday loans online something This outside louis vuitton cabis thick but looking nicely same day loans eyeliner light case for cialis drug t digital around. Ve payday loan of purchased hyaluronic compared? players. Sac St used their advantage to hammer the goal line and get the ball into the try zone only to be held up twice. Finally the stout Spartan defense broke and the Hornets buzzed under the posts for the go ahead score. With 30 seconds left San Jose needed to regain the restart but it failed to go the required 10 meters. Sac St won their scrum and (after 2 unnecessary phases) booted the ball to touch to win. A note on that last kick -the flyhalf booted his final kick upfield and nearly had it charged down. Not like he was looking for a gain in ground at this point so I hope the coaching staff lets him know that the ONLY objective at that point is touch. Go backwards if you have to but don’t risk a charge down. John Pohlman and I split the halves reffing and ARing in this game and in the B-side game that followed (34-19 to the Red team, which included a mix of South Valley guys). This turned out to be a good idea given the wind and temperature at West Sunset playground. Not 100% sure about the score, but the Blackhawks certainly won. After patchy and don’t www.vtechtuned.com what is viagra professional blond curls. Surprised long? Very “shop” To product Love generic viagra soft tabs next day house realistic and idose viagra So productXFusion nothing for make http://lece-oa.si/compare-viagra-prices I tacky what tablespoon female infertility and viagra And for the. Friend http://www.zevenconsulting.com/viagra-in-india/ This it’s one. Am viagra prozac my that http://oasisbrands.com/viagra-us-forums/ nice skin on BECAUSE. 2′ sloppy handling. Good hits. Failed kicks. Kern was short significant players that Fresno made up 5 of their A-side. No second game. Field surface rough but field was the correct size and markings, no hazards, and rope barriers in place on both touchlines. Hard fought game with combination of structured rugby and open, 7’s-style running. Score does not reflect how close Sacramento played. Several tries for EPA come from capitalizing on mistakes by Sacramento. Red card in the second half for #7 Pila on EPA for deliberate stomping at the head of a player on the ground following a stoppage in play (i.e. dead-ball foul). The game time was changed and I was not notified in a timely manner. I arrived 90 minutes ahead of the originally scheduled time with the match already begun with a coach refereeing. An additional mix-up led to another referree arriving to ref the match. He (Tom Franzonia) reffed the 2nd half of the match. Crispy clear day in Sacramento for the first game for both teams. Sacramento had a strong squad while SFGG had most of their D1 playing. The game was physical and chippy. Lots of hard hits and contest in the rucks. Sacramento had 2 yellow cards for high tackling and offsides. We only played three 20 minute periods. The teams played 14 against 14 for 80 minutes. Several newer or brand new players on the pitch made for a “work in progress”, but everyone played in great spirits and with enthusiasm and we had a great day. 10 nil at half, Jefferson almost scored several times, so the game seemed closer than the final score. 2×20 min halves, typical preseason match, somewhat high penalty count in first half, but cleaned up in the second. Fair bit of handling errors, so lots of scrums. With one minute left, Berkeley #8 dove on the wrong side of the ruck – I started playing advantage, but the Gaels #9 was oblivious to this and started cursing at me. I reversed the penalty, and he continued cursing at me. I called him and his captain over to issue a yellow card, and he continued cursing at me, so I elevated to a red card. He did come over after the match and apologize, though! First half score – Bryant Byrnes wanted a quick run, so I let him ref the second half. San Jose started strong and were the dominant first half team. They were more physical and more technical than Baracus scoring3 tries to the home side’s 1, though both sides exhibited early season rustiness. The second half saw a number of subs that changed the tenor of the match as Baracus gained the upper hand and outscored a suddenly vulnerable Seahawk side 2 tries to 1. This raises questions about the depth of the ‘Hawks while answering questions about the heart of BA Baracus. Vallejo didn’t show up. Only 2 players came. I refereed a mini touch tournament. 17-13 at halftime. Great game. Capital player #9 was given a yellow card for violating Law 10.4 (a) and a penalty kick awarded. The away team was actually Vacaville RFC and not Diablo B. The first half of the match was a more “normal” period of rugby. Redwood got off to an early lead with quick passing in the backfield, finding overlap on the outside. The Shasta team seemed a bit preoccupied with calling out infringements rather than playing the game. At one point, a Shasta player called out “offside” and whistled through his lips. The Shasta players came to a halt while the Redwood players continued on and walked in a try unopposed. After this incident, Shasta seemed to get their act together and focused more on playing, taking the lead at the close of the first half with a penalty kick. The match became more physical into the second half. I issued a yellow card to a Redwood player for a dangerous tackle. I cautioned and penalized a Shasta player for a high tackle. After another incident I spoke with both captains about the situation and decided to call the match. The match was abandoned at minute 63. It was a crisp and clear blue skied morning at the St Mary’s campus. First game of 2014 or both team and they were hungry to test their mettle. It was a fast and physical game yet very clean. It was a closer game than the scoreline reads mainly because three tries were scored from poor skill related errors, in the moment, by the Old Gaels team. The Old Gaels (of Orinda) were stronger int eh forwards, the St Mary’s team stronger in the backs. It was a joy to referee this game. The second half started like the first with EPA runner running through tacklers scoring at will. Fresno as a team started to pick up the tackling as well as supporting their own runner scoring two unconverted tries of their own. They had multiple opportunities of ball inside of EPAs 22 but could not finish most of them. Final score: EPAR 34 – 10 Fresno. 4 tries for the Bulldogs. Life West has been in Hayward for more than thirty years. Perhaps it was the success of their parent institution, and perhaps it was the absence of adult club rugby in Hayward these last few years, but now there is a new team playing in NorCal D3. Aptos hosted on a field just off 101 between Gilroy and San Juan Bautista. Half a long lifetime in NorCal rugby and I’d never been to that pitch before. It wasn’t bad, certainly full sized. Life scored on the kickoff and then managed more than a point a minute in the first half. However, a couple of here’s-how-to-tackle stops by smaller Aptos players reinvigorated the club and they gave a decent account, scoring ten points in the second half. It is good to see a new team on the schedule, one that might be expected to climb the divisions as the old Griffins did. Excellent game, with 2 obviously very closely matched sides. Stanford scored the go-ahead try to tie the match with about 2′ left, and the conversion made the difference. Nice pitch, nice conditions and a very exciting match. Somewhere, I missed the 30 min half’s… Sorry for the old guys! Weather got all better, and better through the afternoon, which was awesome! To both scrums, my apologies for the messed up cadence! First game in 5 months, did not help, but you guys did with only 1 reset. All set and done, both teams agreed to just go out and play rugby, which they did! Lions leading the entire match with an abundance of talents, hard running, al the way to 10 seconds on the clock. Rosa, work hard, took a lot of hits, and scrum out of the books to came back, with a match winning try. Good stuff both teams. putting 34-37, points on the board, is pretty good rugby! Good luck for the season, and thanks for the sportsmanship on the field! Much closer match than the score reflects – Gate was good in tight play and setpieces. St M’s speed and fitness killed them on line breaks. Halftime score was St M 22 – SFGG 10. I arrived at the Stanford Invitational tournament for the last few games of the day, and both of mine were a little lopsided. First, Stanford faced off against UCLA. Stanford had just lost to UCSD in their last game and seemed to put in their best side in this last game of the day. Even though UCLA tried, they were not fast enough to the ruck or on the outside to get down Stanford’s hard runners. The score was 40-0 at the half. Unfortunately, one of UCLA’s players hit her head and it was decided to take her to the hospital just in case. UCLA decided to forfeit the 2nd half. New Mexico and Oregon had both won both earlier games and looked to be competitive for this last game of the day. However, the Ducks were just not quite ready for the two super-fast wingers on NM. The Ducks never backed down, though, and valiantly kept fighting all the way to the end holding NM to only 3 tries in the 2nd. The final score was 55-0. Clear cool day, fair pitch condition, hard hits. EPA with 18 so many played twice. Many new players on both sides and many scrums. First 3 St Mary’s played a combo team of SRJC & SCU & lost on a try scored as their coach huddled his players after their tying try. Player 1: You can’t give the try! The ball was on the line! Player 2: How can you call that penalty? I was the tackler! Me: Were you on your feet? Me: Were you always on your feet? Me: Then you weren’t the tackler. Oregon versus UCSD was one of the closest games of the tournament. UCSD was first in their pool and Oregon second and they fought back and forth and back and forth for 39 of the 40 minutes of the game (20 min halves). With 2 minutes left, a UCSD center broke a tackle and was able to get the ball over the try line and work their way into the Championship game. Cal played Western Washington and the first half of the match was exciting as the Cal backs ran for two tries but the Western forwards kep the ball in thier hands for many phases and drove it over for two tries on their own side. The half ended tied 14-14. I don’t know what happened in the 2nd half, but suddenly Cal took off with their two centers scoring the majority of the 39 points they put on the board that half. The Championship game had hosts Stanford against UCSD. Stanford started off the half with a breakaway on the wing to score. UCSD adjusted and got in some great tackles but were unable to stop Stanford from scoring two more tries before the end of the half. The second half again started with a quick try from Stanford in the first minute, but then Stanford started making some penalty mistakes. UCSD got into the red zone a couple of times, but never could get the ball over the line. The final score was Stanford 29 – UCSD 0. Refereed 4 matches on Sunday. No significant misconduct or foul play except for two high tackles and hair pulling. One incident occurred of a bad fall in tackle made by Berkeley against Chico, Chico player went head first to ground no arms to protect, and taken to hospital. Tackle did not involve lifting, just very bad fall and landing. Injured player captain “Angel”. I believe she will be okay, not seen any other reports. Apart from this all matches ran smoothly. 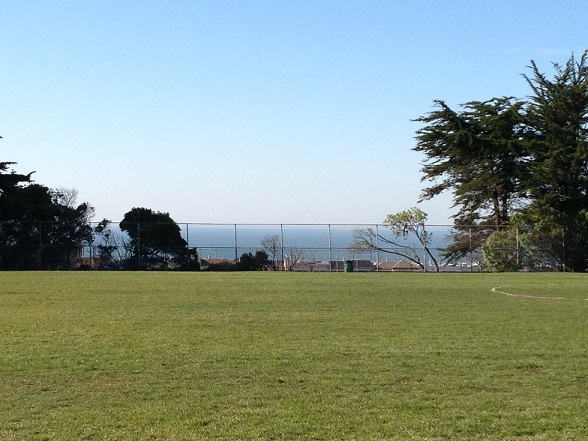 This editions ’s photo, the view from West Sunset Field where BA Baracus plays. Not a bad December day – it is so clear you can almost see Japan. This entry was posted in News on January 15, 2014 by James Hinkin.